participation in the performing arts which improves the quality of life for students of all ages. From the tiniest toddler to the most mature adult, the study of music fosters both personal and social growthboosting imagination, logical thinking and memory skills, as well as promoting emotional and physical well-being. It is never too early or too late to join in making music. Embark on the journey of a lifetime today! will contact you with information. A method that teaches note reading early and utilizes all styles of music including Classical, Jazz, Hymns, and Broadway. Each child learns by listening and repeating sounds just as we learn to speak. 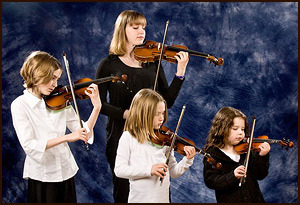 The Suzuki method is especially designed for the young beginner which includes parent participation. The younger violin students play on miniature instruments, just their size!